This recipe by Ina Garten is easy enough for a quick weeknight dinner (put it in first and make the sides while it’s cooking). It’s makes great leftovers for lunch too! Rinse and dry your chicken pieces and arrange in heavy roasting pan. Season generously with salt and pepper on both sides. 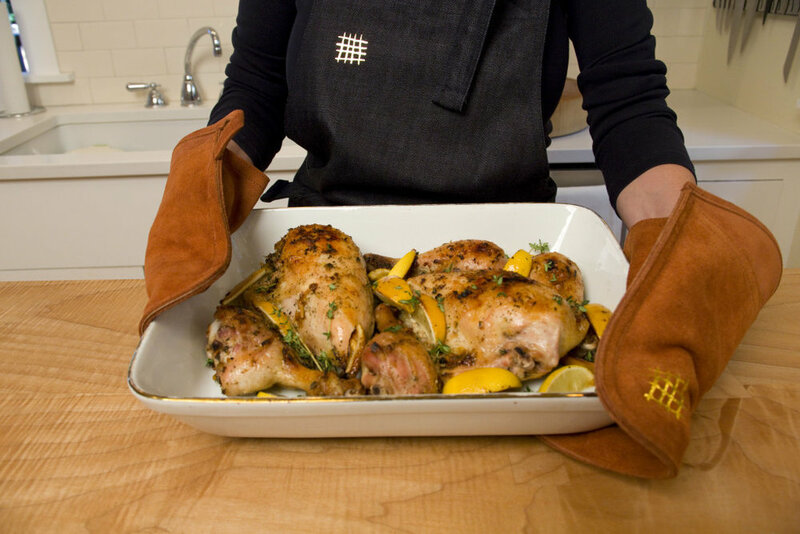 Grate the zest of two lemons and distribute evenly among both sides of each piece of chicken. Cut your lemons in quarters and place in the roasting pan. Finish by sprinkling with a glug of olive oil and the thyme. You can pick the thyme from the leaves or just throw the leaves on top. Either works just fine in my opinion. Bake for an hour and check with your meat thermometer. Adjust cooking time accordingly. Your thermometer should read 170 degrees.